Judging by page views, Global Handshake Day was a success--albeit a minor one. I'm encouraged by the response and will work for a second Global Handshake Day six months from now. I still like this story and article: my wonderful Aunt, Alma Reeck, thought my brother, Jerry, and I would benefit by a trip to Washington, D.C. to learn about our government in the capitol. So in May, 1961, she and Jerry flew from Seattle to New York City, where I was living. There, she picked up a new car at a Nash garage on the Upper West Side and we were off to Washington, D.C. to meet our representatives and to see the monuments. 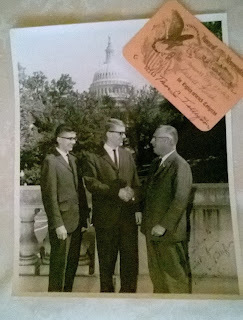 The photo depicts Jerry and me with Rep. Thor Tollefson, the beloved U.S. representative of that era from Tacoma The point is: TOLLEFSON SHOOK OUR HANDS. What is a handshake, anyway? Wikipedia has a fascinating article on the shake. Humans began shaking hands to prove that the hand contained no weapon. 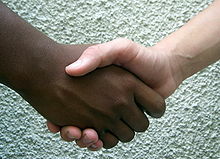 If so, the handshake originated to symbolize PEACE and a SAFE WELCOME. Photo by Rufino via Wikimedia Commons. Shaking hands is a ritual moment in many sports, before an athletic match or after a match, win or lose. In West Africa, where I spent a lot of time in the 1960s and 1970s, people practice a special “snap shake.” Wikipedia explains: it’s “a gesture of greeting, in which two people shake hands in the conventional Western way, but end the handshake with a mutual press of the fingers that creates a ‘snap’ sound.” Today, when I meet a Sierra Leonean or Liberian, I’m likely to give a snap shake, and enjoy their surprise at being greeted in that familiar way by a foreigner (me). I’m a Christian with deep roots in the Evangelical United Brethren tradition. One of our top “EUB” symbols was the handshake under the cross. Though this image is subject to copyright, its use is covered by the U.S. fair use laws because: # It illustrates an educational article about the entity that the logo represents. I'VE ALWAYS GIVEN A HANDSHAKE. It's a habit with many good meanings. Examples: as a pastor, when I delivered a signed wedding certificate to newlyweds, I’d do so with a handshake. On each Sunday after church I’d shake hands with every parishioner. On Sundays, at the ritual of the “Passing the Peace of Christ,” I shake hands with, and greet, my wife and others seated around me. "The peace of Christ be with you!" If I had the opportunity to meet the Queen of England, I’d hope to take her hand, gently, with a bow, as a greeting. So what’s with the U.S. President? He’s reluctant to shake hands? Even with our closest allies? Reportedly, in their recent photo opportunity, Prime Minister Justin Trudeau had to formally propose a handshake during the photo opportunity. And on Friday, 3/17/2017, the Leader of the Free World, Chancellor Angela Merkel proposed shaking hands and reportedly received no response except a sort of huff-expression. I’d like to meet the President and give him my hand, but not if shaking hands with a resister is off limits for him. A handshake can start a friendship. I probably won't get that chance. But for you, me, and humankind in general, LET'S SHAKE ON IT! For God’s sake! For the sake of country! For the sake of the world! Yes, shake hands to communicate friendship, working for community despite differences, respect. MY PROPOSAL FOR IMMEDIATE ACTION? I suggest that on each March and September equinox, we all shake hands intentionally. With whom? Your classroom. The grocery clerk. Your boss. Your employees. Your family. Your dog. The GOAL; every human being and many other animals in the world receives and RETURNS A HANDSHAKE. Simple, but elegant. "GLOBAL HANDSHAKE DAY." The Equinox adds more meaning to the global handshake: an acknowledgement that the warm sun shines equally on north and south. TUESDAY, MARCH 20, 2017: GLOBAL HANDSHAKE DAY. Agreed? I THANK YOU for helping to launch this worldwide ritual. Click below on a "share" tab. Let it go viral, globally. Watch for the next GLOBAL HANDSHAKE DAY. P.S. Hand shakes spread germs. Wash your hands for 20 seconds.